The 908 is a simple, price point skate that won’t break the bank. It is inviting to both beginner and top-level skaters. While there is room for improvement, there are very few skates that do the same for the same cost or less. Some cons I will mention have been improved upon with the 2nd edition 908. Very lightweight skate without feeling cheap. No clacking or clicking. Liner is lightweight, comfortable, breathes well and because of the liner hood, it stays put. Soul plate is very slightly concave and allows for less friction on soul tricks on new plates. Rib-cage style lacing system allows for varied tightness from the toe box to the instep to the ankle. Excellent groove trick skates for a more traditional stance. The royale groove promotes a more forward angle stance while grinding, opposed to a perpendicular stance, allowing you to more easily face the direction you are grinding. Fairly flexible skate, depending on what skate you’re coming from. If you’re used to a USD Carbon, you might think the forward flex of the cuff is too much and will need to adjust to that. Material has been hardened with the 2nd edition 908. Insole is simple and does not offer much support for people with high arches. Raised heel design leaves less options for a heel shock-absorber or upgraded insoles that feature a heel shock-absorber. No 45-degree strap option for added support. Hardware for both soul plate and cuff can be difficult to remove, or even be stuck and may require drilling out and replacing screws and t-nuts. Hardware has been updated to resolve this problem with the 2nd edition 908. Cuff design can rub on top lace loop and potentially cut your laces. Stock laces are very fragile and frayed within the first hour of skating when laced all the way up. These skates are great cheap skates! The unique design makes them extra responsive. The only cons I have is the cuffs are very flexy. More flexy than the boot. hands down best skates out the box. i own roces m12 ,roces fifth element, k2 front streets,60mm aeons, razors shift 2, and rollerblades original new jacks and i can say they skate as good as any of my other skates out of the box no need to be broken in.for 165$ you can't find a better quality boot. 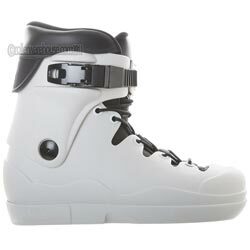 Them Skates Ivory GC Skates 11/12 ONLY! Them Skates Black GC Skates 11/12 ONLY!